By Scott Gilfoid: Tony Thompson (38-3, 26 KO’s) is looking to add another British scalp to his collection after taking David Price’s for the second and likely the final time last Saturday night in their rematch at the Echo Arena in Liverpool, UK. Thompson now wants to pick off Fury and take his scalp in front of his own fans in the UK if he’ll accept the fight. Thompson doesn’t think he will, but he’s putting it out there just the same that he wants the 6’9” fighter. Actually, Fury is ranked #5 WBO, #6 WBC, #11 IBF. I think he wanted higher but after worming out of his IBF eliminator bout against Kubrat Pulev, he was dropped a little. It would still be great for Thompson to thrash Fury and get his ranking, but the problem with that is Fury isn’t going to take that fight. He’s got a likely match-up with David Haye coming up, and there is no way on earth that Fury is going to win that fight. 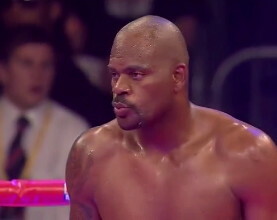 He’s going to lose it, but the only thing we don’t know is which round Haye will be knocking him out. I see Fury tipping over within in the first two rounds and staying down. It would probably take a minor miracle for Fury to finish the fight on his feet because he’s going to be getting hit with some rocket shots from Haye, and unlike Wladimir Klitschko, he doesn’t have the power or the defense to keep Haye honest. Fury’s high ranking will take a huge hit after he gets blasted out by Haye, but he’ll still be ranked in the top 15. It might still be in Thompson’s best interest to try and get a fight with Fury even after he gets beaten by Haye, but I still don’t see it as being a fight that has any chance in getting made. I mean, if Fury has no interest in fighting Thompson now, why would he suddenly develop interest after he gets knocked out by Haye? « David Price: Where Next?